All tracks featured here are in Real Audio format. 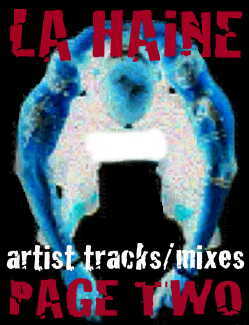 Some cd quality versions of the tracks can be found at the following url, http://www.mp3.com/La_Haine_Prod. Each track featuring "big name" artists are mixed courtesy of, you're lookin at him, La Haine. To have your track(s) featured here, hit up my beats, rap your lyrics over 'em, then send me the track in either mp3 (preferred) or Real Audio; and since my hotmail account only allows minimal size files, I'd prefer if you gave me a URL to where I can download the song. Click here to choose from my many beats.